Doughnut burgers are not for everyone, in fact they may only be for the late Luther Vandross, but whatever you think of them, they are actually a thing. And now they are an even more festive thing. 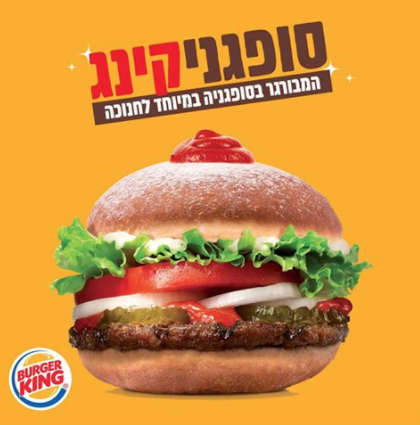 To celebrate Hanukkah in Israel, Burger King announced that later this month, the first day of Hanukkah, it will be serving the Sufganiking—that would be a burger based on sufganiyot, the jelly doughnuts eaten by Jewish people during the holiday. Rather than the traditional doughnut burger (is there a “traditional” doughnut burger?) the fast food giant is making a savory version of a doughnut bun—deep fried and filled with ketchup instead of jelly. The rest of the burger will be a traditional whopper with tomatoes, pickles, onions, lettuce and mayo. The CEO of Burger King’s Israeli operations called the mashup “inevitable.” Now, we’re not saying that’s corporate spin, but we will point out that the Jewish people have survived for more around 4000 years without a doughnut burger. So draw your own conclusions. The victory of the Maccabees will be commemorated in fast food from December 25-January 1 for about $3.90. As for us, we’ll stick with the real thing—totally beef and ketchup free—to get our doughnut fix this Hanukkah.